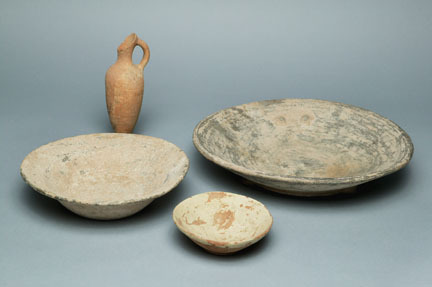 The oldest materials in the Rietz Collection of Food Technology are common unglazed terra cotta vessels from ancient Palestine and decorated serving-ware from Cyprus. Dating from roughly the 10th to the 6th centuries BCE, the bowls, pots and jars represent the forms of vessels used for storage, preparation, and serving of food and drink that would have been common during the Iron Age. These items were the most basic tools of ancient cooking, used at every meal, and often were items of trade. Produced by Phoenician colonies on the coast and islands of the eastern Mediterranean, these objects were exported to the Levant and Egypt. Such common and ubiquitous trade goods underscored the shared cooking and eating technologies of differing cultures throughout the region. Their basic structure and function remained unchanged for millennia. The Collection also contains bronze cooking vessels from Roman Palestine and date from the 1st century BCE to the 2nd century CE. Although badly corroded, they illustrate the shapes of cast metal cooking vessels of the period. These vessels represent the cooking technologies of more affluent households, as metal cooking vessels would not have been available to most people. CAS Photo/Dong Lin Other objects in the Collection from the eastern Mediterranean are 5th century BCE Greek drinking vessels. The cups and pitchers are highly polished with a rich black slip glaze. 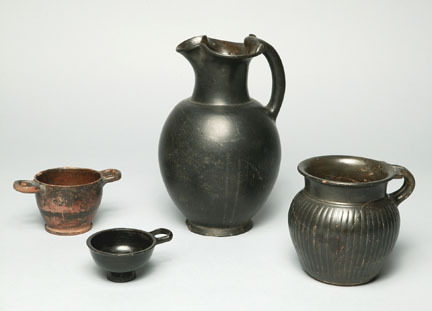 Used by the upper classes of Greek society throughout the Greek colonies of the eastern Mediterranean, these simple yet elegantly stylized objects allude to the highly ritualized practice of drinking wine.